Being as how it is exactly 3 weeks today until Christmas, it was time for some seasonal clothes for my dolls. I made this black striped sparkle sweater using Simplicity Pattern 4297 shirt A and an “old” sweater shirt. This pattern is basically like a Baseball tee, only for thicker fabric. 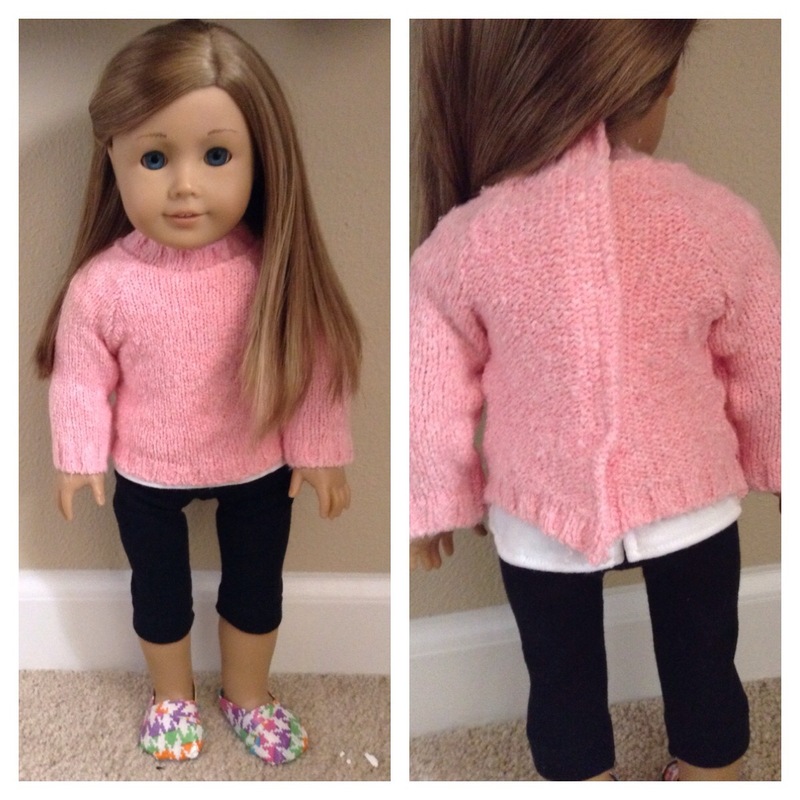 I also used it for this outfit to make a pink sweater. 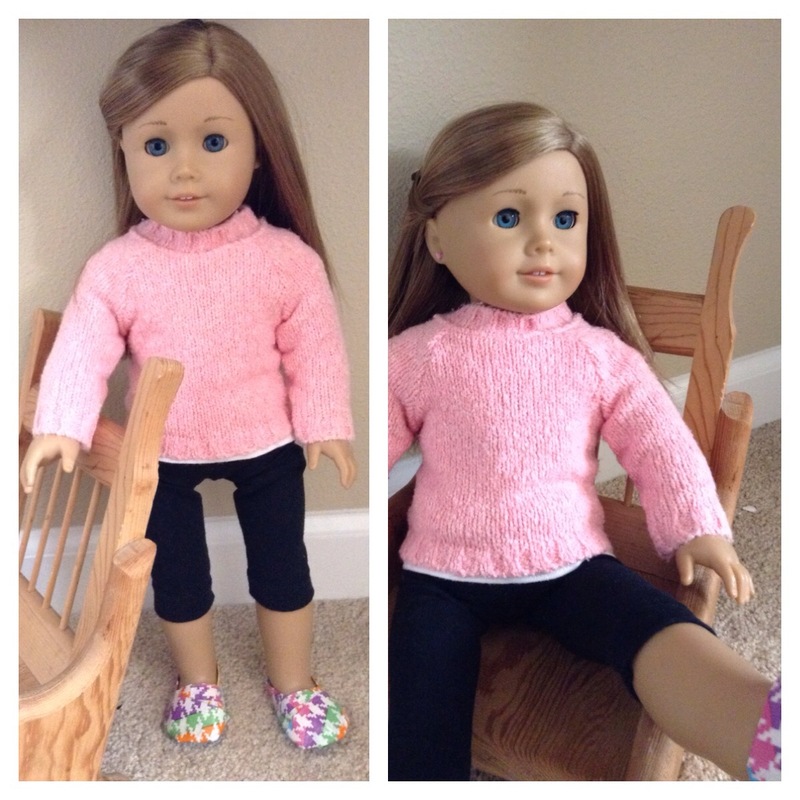 The pattern is fast and simple to put together, especially because I used the finished edges of the old sweater for all the edges of this doll sweater. Not hemming edges saves a lot of time! 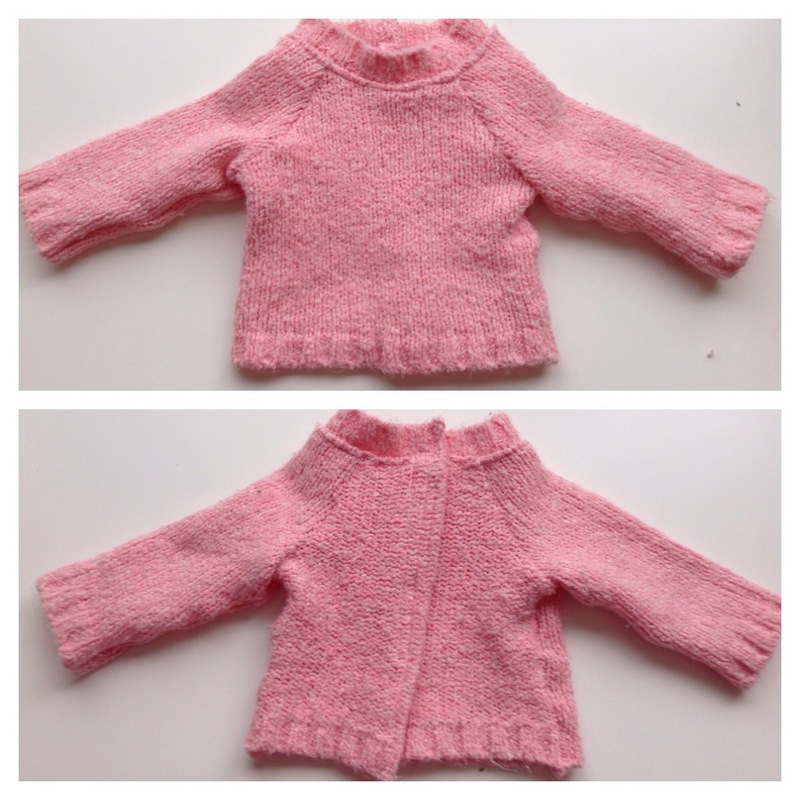 The pattern also involves a neckband, which I excluded when making this sweater and hemmed the neckline instead. This alteration gives the sweater a lower neckline. I took some pictures with the sleeves scrunched up to 3/4 length, and some at their normal length. They are extra long sleeves, which I think look comfortable. Underneath the sweater my doll is actually wearing the silver leotard featured in this outfit. This is mainly due to the fact that I didn’t have any black knit stretch fabric on hand to make a spaghetti tank to wear underneath the sweater. I plan on adding a tank underneath when I have the fabric. The skirt is two rectangles of fabric measuring about 20″ by 7″ (I’m not sure I’m just guesstimating). The two rectangles are red 2mm sequin fabric over black chiffon. The black chiffon I up-cycled from a human skirt. Although both fabrics are see through when standing alone, together they are perfectly appropriate. The black chiffon is about a fourth of an inch shorter than the red, allowing the red to hang a little longer. The two fabrics are joined at the waistband with a fold-over elastic casing. I used 10 1/2″ of black elastic. I made the necklace by twisting white embroidery floss and tying it off. I have a Christmas charm bracelet that I have had for a few years and never worn. I decided it was time to make use of it and took off this snowman charm and put it on the white floss. The charms are a perfect size for dolls. Necklace! I added some leggings to the ensemble as an afterthought. These leggings were featured in this outfit. The shoes are Tree House Studio, which are sold at Hobby Lobby. I used them in this outfit too. This is an up-cycled sweater made from Simplicity Pattern 4297 shirt A. I did not alter this pattern at all. I cut the edges of this sweater on the edges of the original sweater, so I didn’t have to do any hemming which made the project rather quick. It closes in the back with Velcro. 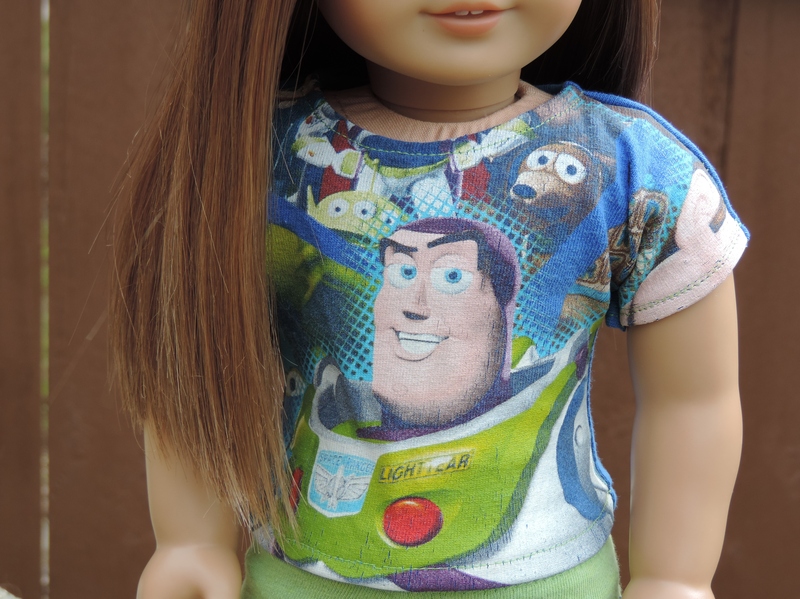 Underneath the sweater the doll is wearing a white t-shirt. It looks cozy for the cold weather that is already upon us. The leggings are featured in this outfit. 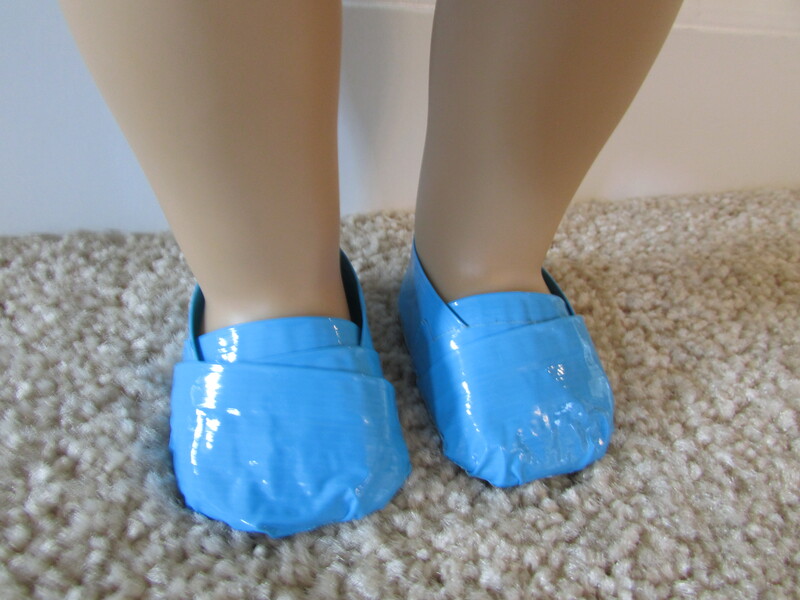 The toms style shoes are made from contrasting colors of duct tape. I used this YouTube video. To complete the outfit, the doll has stick on pink heart “earrings”. These are nail decals and are the perfect size for doll ears. I stopped by Hobby Lobby to check out a few things and found fat quilting quarters measuring 18″ by 20″ for 84¢ in the remnant section. Although this wouldn’t be enough material for human sized articles, it is enough to make a dress (or possibly two) for a doll! I also found some other fabric (for under $1), which ya’ll will be seeing in future posts. The bodice for this dress is from this pattern: Katie Dress. I sewed some black rick rack to the neckline. I didn’t put it anywhere else on the dress, because sometimes I think rick rack can be overpowering. It attaches with Velcro in the back. I am okay with using Velcro on doll dresses, instead of a zipper. The skirt fabric is 4 1/2″ wide by 18″ long, gathered to 12 1/2″ long. The shoes I purchased on Amazon.com, from Sophia’s as part of this set. I realized when I put them on that they are rather tight. They look fine, though. 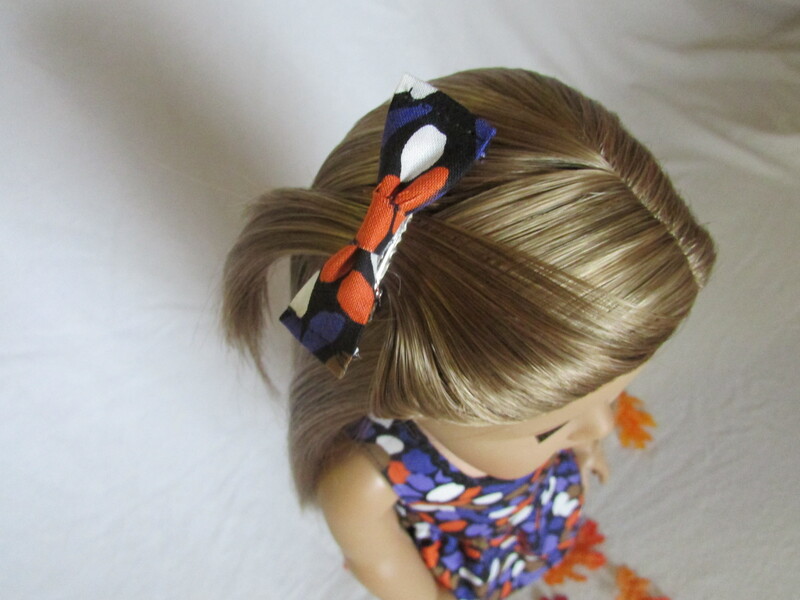 The hair clip is a scrap of fabric folded over, hemmed on each edge, and folded in at the middle. It’s hot glued to a 1″ mini alligator clip, which came in a pack of 25 from Hobby Lobby for $2.99. That’s about 12¢ each. 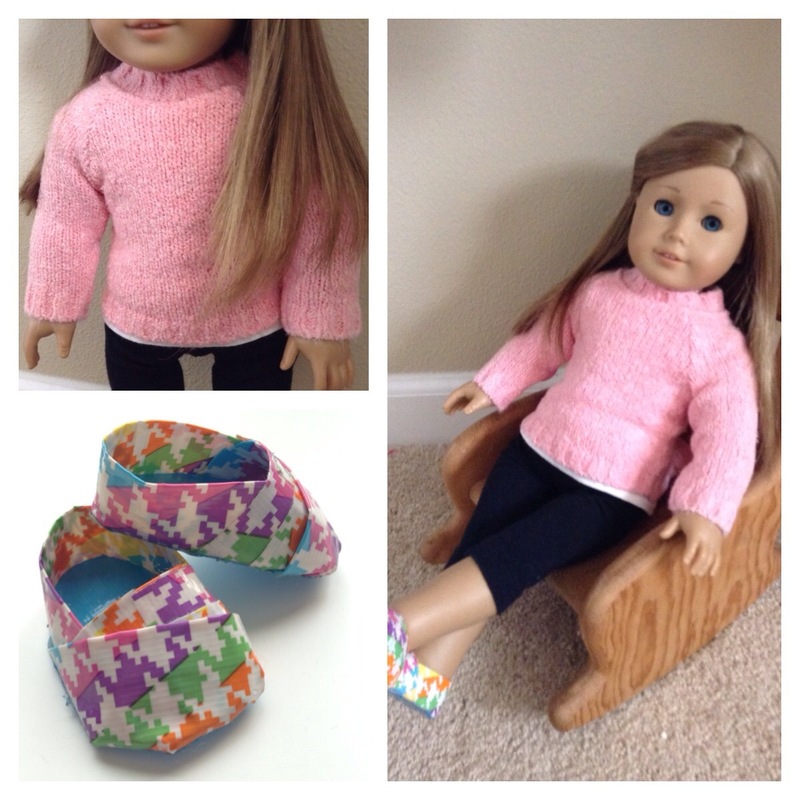 A great place to find a lot of patterns without searching the Internet to find them yourself is Mommy’s Doll Club. Each themed patterns post has links to many free online patterns. This is my 100th post on this blog! AG Halloween Costume, Part 2: Dress with Shoes! At first I thought I would make a pair of red shoes for the dress out of the extra fabric I had, but I think shoes are hard to make. I discovered from Say Hello To My Little Friends about Tree House Studio doll shoes sold at Hobby Lobby. I went to see if the particular Hobby Lobby store I go to carried them. They had about 12 different pairs! Also, I was pleased to find that they were only $5. I bought the red sparkly flats to go with my Thoroughly Modern Millie Halloween dress. 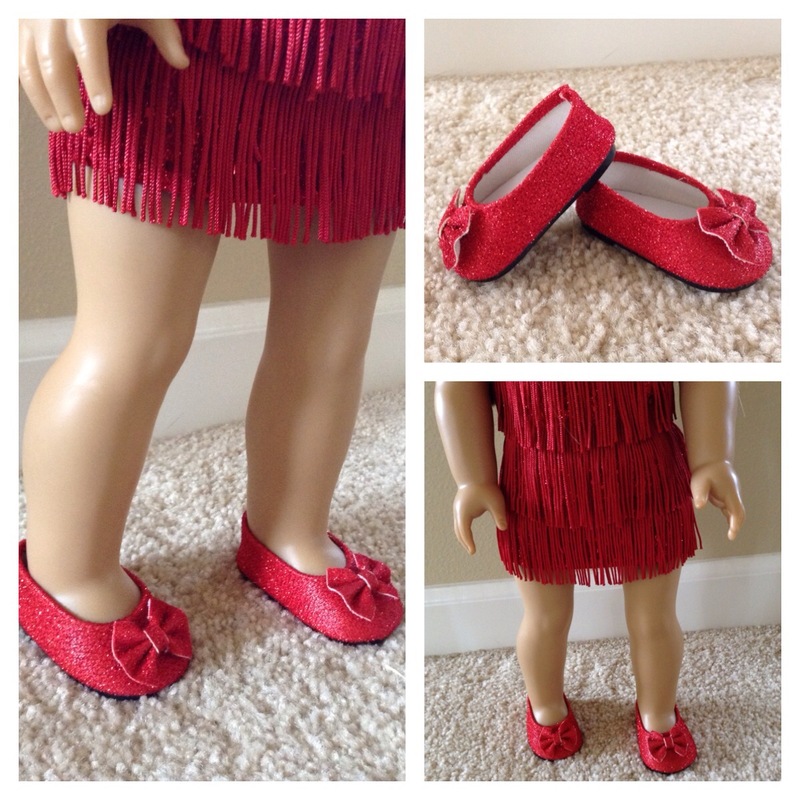 They aren’t exactly 1920s period shoes, on the other hand they are red and AG dolls can’t wear 1920s high heels anyway. 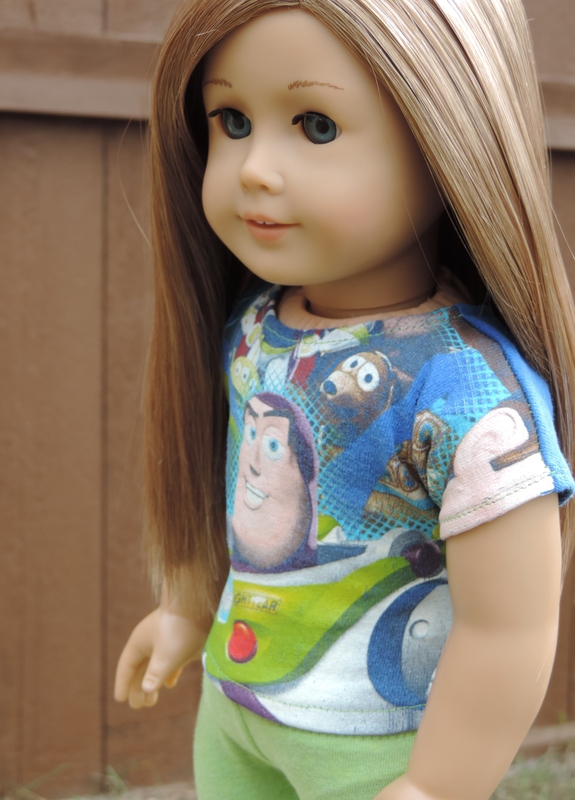 They fit my American Girl Doll great! I didn’t expect them to fit my Kidz n Cats doll, however I tried them on for kicks. They are obviously not designed for Kidz dolls. Like I said, I didn’t expect them to, so it’s okay! I am quite pleased with the inexpensive foot covering for AG. I will probably definitely buy more pairs in the future. As long as the shoe stays intact, I am not too concerned by quality in general. 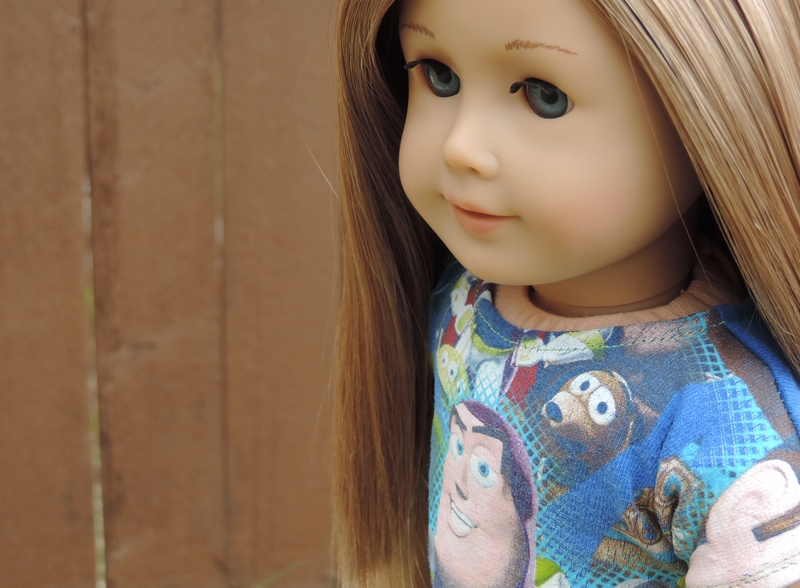 They do not have to be practical – they are for a doll! – , they just need to look the part. That’s the way I see it. 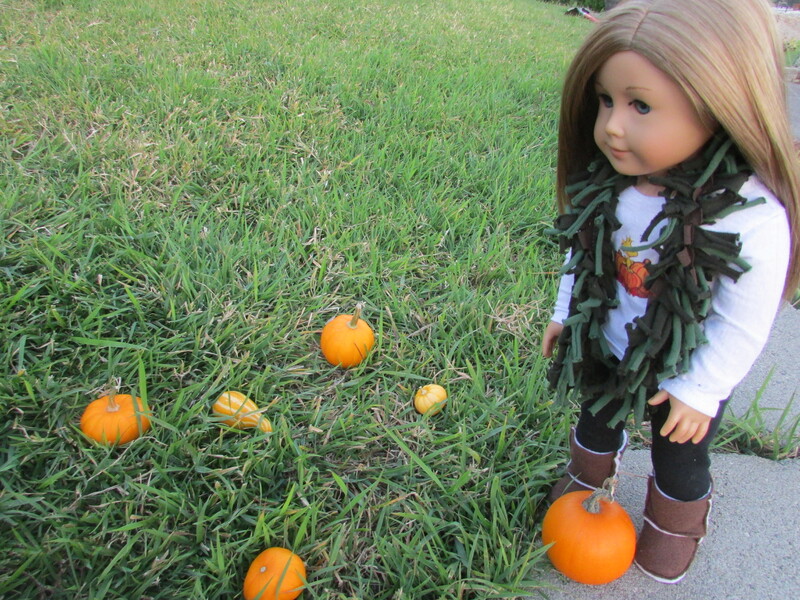 It’s my American Girl Doll’s turn to pose with the mini pumpkins! This was the first long-sleeve t-shirt I made, and I was rather pleased with the outcome! This is the pattern I used. 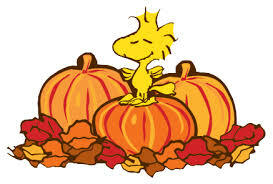 I searched Google Images and found a cute little picture of Woodstock from Charlie Brown on a pumpkin surrounded by leaves to go on the front of the t-shirt. I printed the photo on iron-on transfer paper. The leggings, of course, are the free leggings pattern from SewAdollable.com. 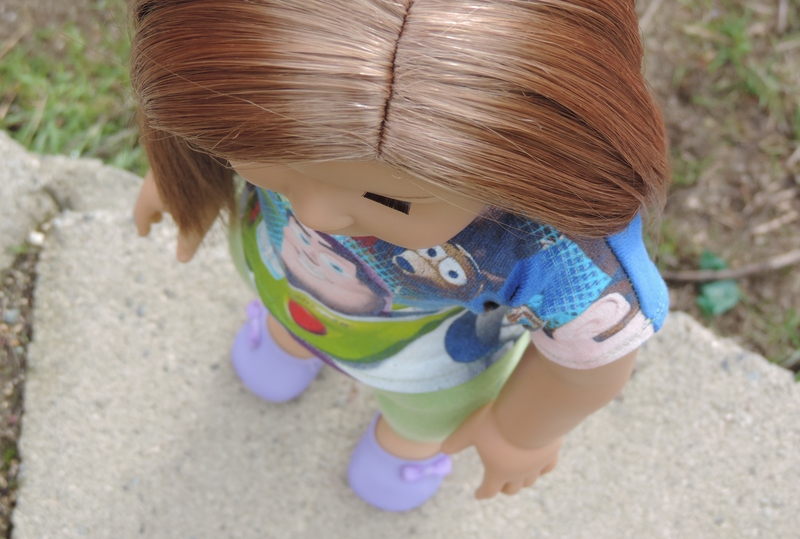 I added about 3/4 of an inch or so to the top of the pattern to make the waistband higher on the doll’s waist. Previously with this pattern I had noticed that the leggings didn’t come up far enough. 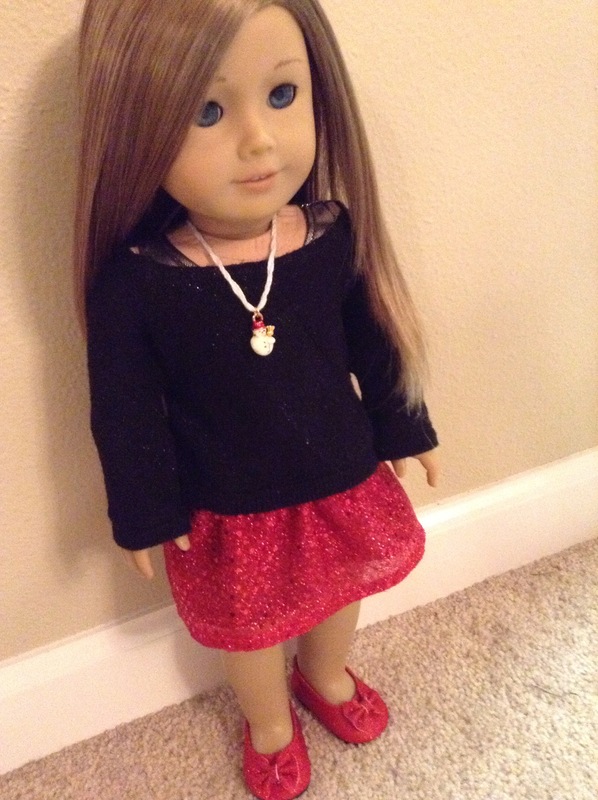 This is the first outfit I have made for my doll using my sewing machine! It was a learning experience, so everything isn’t perfect, but that’s okay. Technically for this outfit to be classified as a “Fall Outfit”, I feel that it would need a light sweater. Therefore, I titled the post “September Outfit”. The tank top was made with the dress pattern here. I excluded the skirt and lengthened the bodice about an inch at the bottom. It attaches in the back with Velcro. The skirt pattern I used is included in Simplicity 4297, which was given to me by a friend. This skirt was skirt A. It attaches on the side with Velcro. The scarf I made using this tutorial on PixieFaire.com. The flower I attached using hot glue to a small pink clip. The flower tutorial is from here. I also made this flower for another outfit here. And the boots I actually made last week for my Kidz n Cats doll, but they matched this outfit and fit my American Girl Doll well. So, my Kidz n Cats doll will have to wait a bit for her boots. 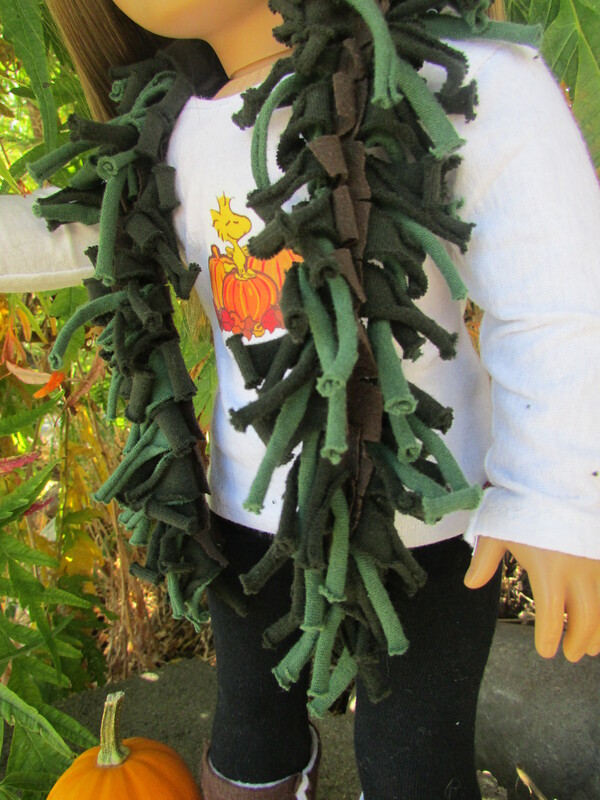 I’ve already bought fabric for my American Girl Doll’s Halloween costume, and am designing it! Here’s a clue to what it will be: This character was played by Julie Andrews in the movie, which takes place in the 1920s. 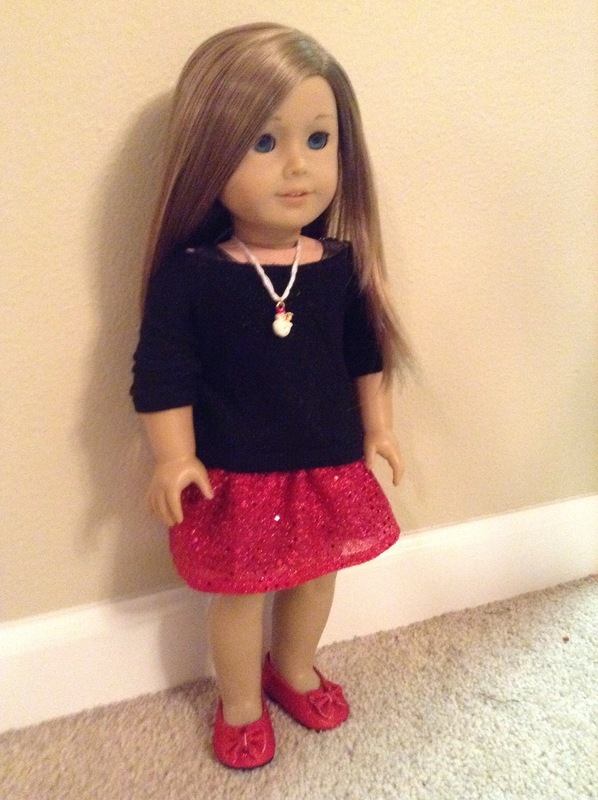 Well, it’s the weekend again so I’ve got another American Girl outfit made! 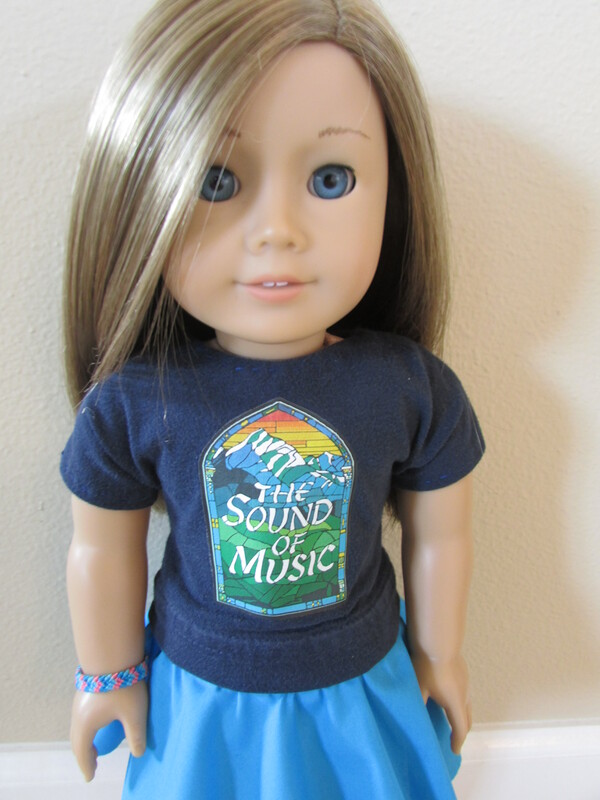 This one as you can see in the pictures includes: a Chevron pattern bracelet, a Sound of Music Broadway logo t-shirt, a turquoise circle skirt, and turquoise duct tape Toms style shoes. 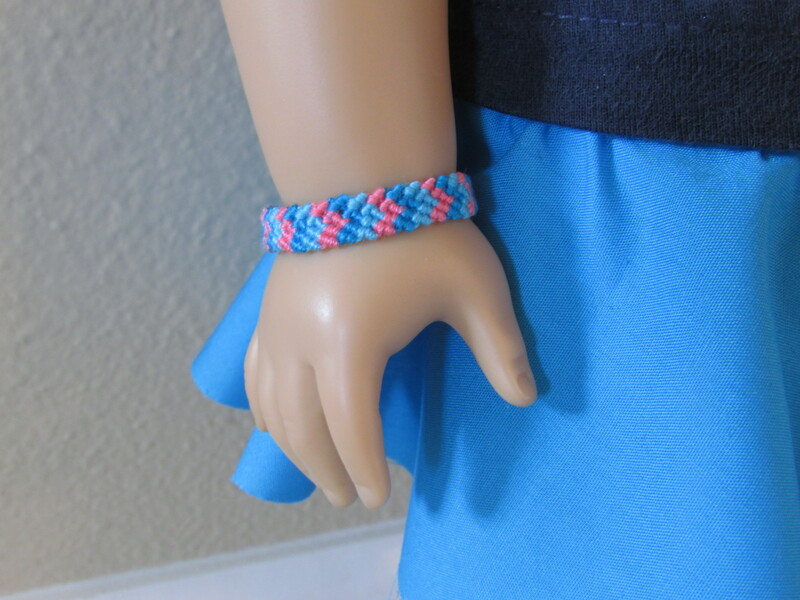 The Chevron friendship bracelet is made of 3 strings, each a different color, folded in half. I have made a lot of friendship bracelets in my time, for myself and for others, so I sized the lengths of the strings down. I’ve made so many of these bracelets, I didn’t need to measure the strings or anything, I could just tell if they were long enough from experience. Here’s a tutorial on how to make a Chevron bracelet: Instructables. The t-shirt pattern is from SimplySweetByb.com here. I also used it in the Purple and Black Skirt outfit. It’s the easiest one to make that I’ve seen so far. I bought Avery Iron-On Transfer paper at Wal Mart. I found a photograph that I could use to put on the shirt. I looked around on Google Images and decided on the Broadway The Sound of Music logo for this shirt. I really like the way it turned out. Using the iron on transfers was very simple and easy. 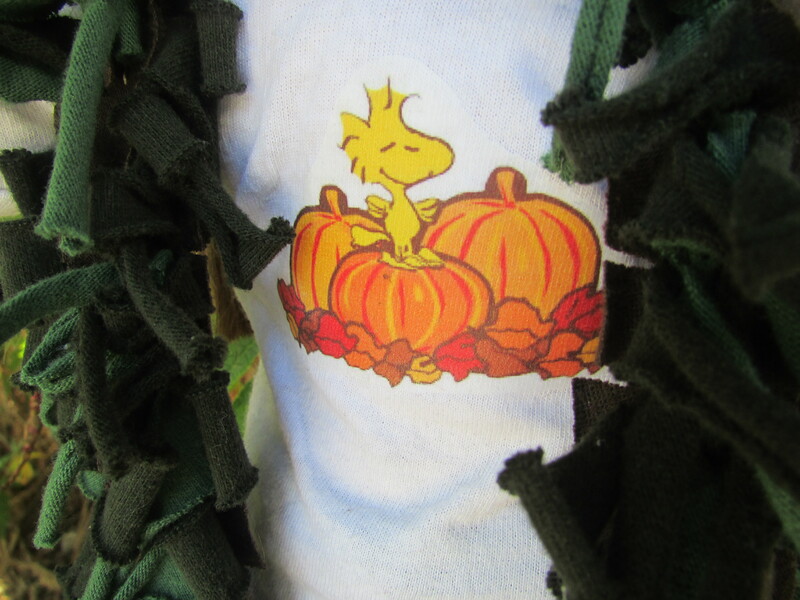 All you need is an iron, tissue paper, a regular printer (preferably a color printer), and iron on transfer paper. Iron on transfer paper is about $7-$10 for five sheets. Since the pictures I print for the t-shirts are small enough to fit onto the shirt, I can probably do three pictures separately onto one sheet, or more if I printed them all at once. I will be making more t-shirts with other designs on them soon! I’ve got some ideas such as Frozen, Tangled, some other Disney themes, and Broadway musical logos. I mostly followed the directions here for the circle skirt. Next time I make one I will make it a little longer then this turquoise one, so I can hem the bottom! Instead of using a cloth waistband, like the tutorial I used said to do, I used elastic and pinned it. I didn’t do it quite right, but when experimenting, one rarely gets it right the first time. Luckily, what isn’t quite right is underneath the shirt so you can’t even see it when she’s wearing it! The shoes are duct tape Tom style shoes from this YouTube video. The shoes in the photo are the third pair of shoes I’ve made this way, the first pair was a trial run with Minnie Mouse duct tape (maybe they’ll be in a future outfit), and the second a patterned pair that will be in a future outfit. After I made my first pair I went to the store and bought two roles of duct tape. I think I need to make a couple more pairs to alter the tutorial to perfection, but they are super easy and quick to make. The way I see it these shoes are nice and way better then no shoes at all (which is what my doll had before). 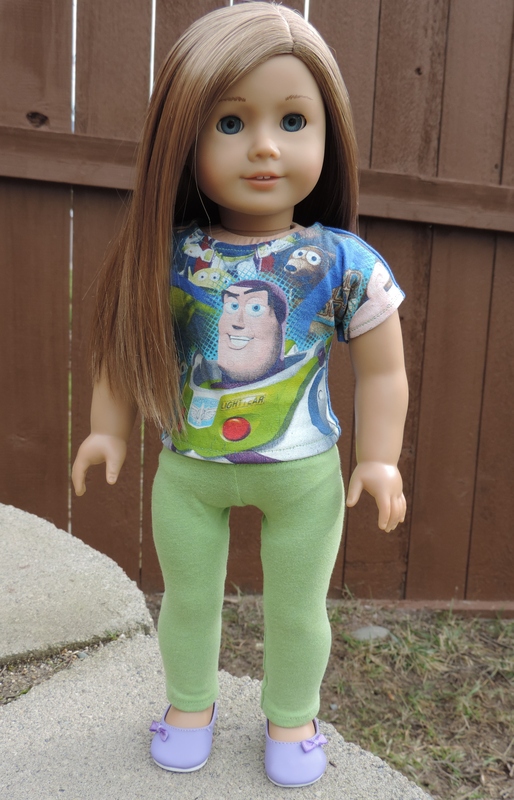 Since I never buy anything for my American Girl Doll, she only has the shoes which she came in and a pair of ice skates I got for my birthday once. The t-shirt is the pattern I use all the time. The pattern is from SimplySweetByb.com here. 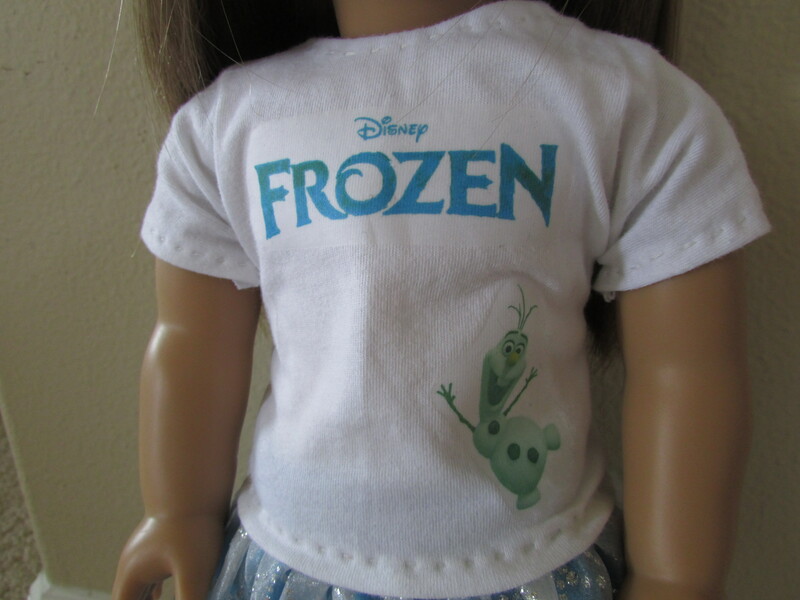 I used stretchable iron-on transfers for the logo and Olaf. I put the pictures I used in this post as well. 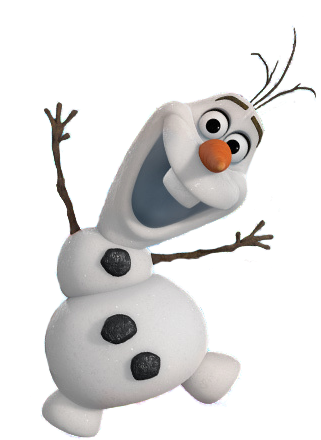 The frozen logo is animated but when you save it as a picture, it will be a regular picture. My printer decided to print Olaf and parts of the logo green… Oh well. The skirt I made using this tutorial. 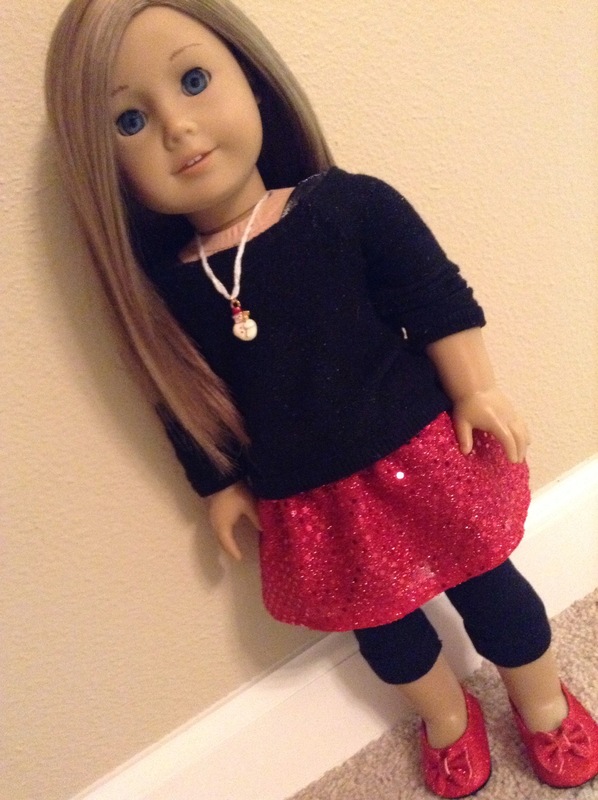 My American Girl Doll must have different measurements then the doll used in the tutorial. This skirt, when finished, was way too small for my doll. Disappointing. I had to squeeze it on for the pictures. If you decide to use this tutorial, make the waistband bigger than 12 inches. I have also made a dress out of the fabric I made this skirt from. The shoes are duct tape Tom style shoes from this YouTube video. 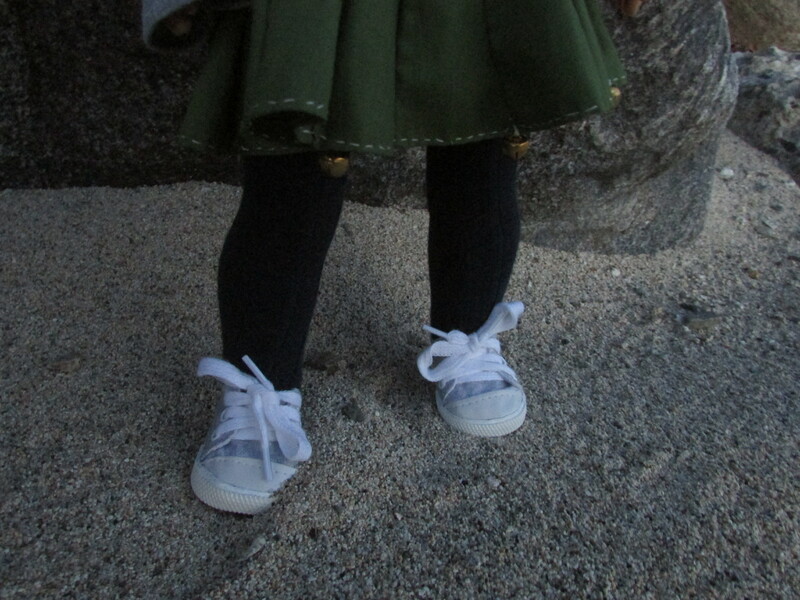 These same shoes are also in my American Girl The Sound of Music T-Shirt Outfit.